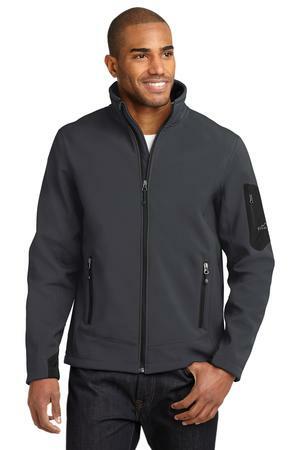 The Eddie Bauer Rugged Ripstop Soft Shell Jacket Style EB534 is available in Men’s Sizes XS-4XL. It can be purchased in your choice of the following colors: Black/Black, Canteen Grey/Black and Grey Steel/Black. A rugged soft shell for hitting the trails or the town. This Rugged Ripstop Soft Shell Jacket is made from a tough, textured ripstop shell and a warm plush sherpa fleece lining. It has a 3000MM fabric waterproof rating, a 3000G/M2 fabric breathability rating, reverse coil zippers, front zippered pockets, welded zippered left sleeve pocket, open cuffs with woven contrast insets and an open hem with drawcord and toggles. It also has a contrast Eddie Bauer logo embroidered on the left sleeve and is made of a 100% polyester woven ripstop shell bonded to a water-resistant laminated film and a 100% polyester sherpa fleece lining. The waterproof rating refers to the amount of water a garment can withstand in 24 hours before it leaks. In this case, the Rugged Ripstop Softshell Jacket can take on 3000 millimeters of water (almost 10 feet of rain or snow in 24 hours) before it leaks. Be the first to review “Eddie Bauer Rugged Ripstop Soft Shell Jacket Style EB534” Click here to cancel reply.